Just back from the annual Virtuoso TravelWeek in Las Vegas, with another round 495 four-minute meetings completed along with other networking and educational sessions with over 1600 Virtuoso hoteliers and other suppliers present. Exhilarating, and exhausting, but always worthwhile, as it makes my job of orchestrating your travel easier and more effective. Top 30 Under 30 rising star agents in the industry - and the only one listed from Canada. Ian has been working with me full time for three years, and is now an invaluable part of Team Kershaw and the work we do to provide you with the finest travel experiences. Please enjoy this recap of some of the things that are new in the world of planes, boats, trains and beds aboard and in between. Our next group cruise, on Azamara from Venice to Rome in September 2016, still has a few cabins left, at a 10% discount in fact. The big NEW news is that we will be looking at chartering an entire Amawaterways ship (74 cabins) for their new Bordeaux itinerary in 2017 (October 26, 2017, seven-night departure). This will mark the first time that we've taken an entire vessel for our friends, family, and clients-who-become-friends, on the only group that Jim and I personally host each year. Let me know if you would enjoy a week in the heart of wine country with a select group of the greatest people on earth! Many airlines welcome small pets, tucked away in their carriers and sharing your legroom, but American Airlines is venturing a step further with a first-of-its-kind "pet cabin." 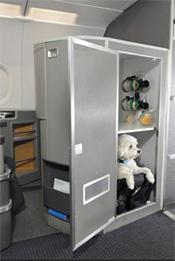 There are two cabins per plane in first class only, each accommodating one four-legged flyer, but only on select flights between New York (JFK) and Los Angeles (LAX), and JFK and San Francisco (SFO). Though your dog might not get peanuts or free movies, having a cabin all to himself means that he won't have to sit next to a guy who won't stop talking, so it's a pretty good deal. You already know I won't travel without Medjet Assist, because I don't want to ever risk being held captive by a foreign medical system. I want to come home! But that was only for medical emergencies. Now, Medjet has introduced a comprehensive travel assistance security and crisis response membership enhancement called Horizon. For an additional USD 139 a year, Horizon provides on-demand access to a dedicated 24/7/365 crisis response center with veteran security experts who can advise and coordinate necessary emergency services in relation to political threat, violent crime, terrorism, hijack, disappearance, blackmail, extortion, wrongful detention and kidnap for ransom, and cash advances if required. And yes, I added it to my own Medjet membership! Crystal Cruises has announced a major expansion plan which will see it moving into the river cruising business, luxury yachting and even offer jet tours over the next five years following a big investment from new owner Genting Hong Kong. "We really came up with a global strategy to become the world's premier luxury, hospitality and lifestyle brand portfolio," CEO Edie Rodriguez says. "It will make everything else that exists (in the luxury cruise industry) pale in comparison." The 62-guest Crystal Esprit will enter service in December 2015, as part of the new all-inclusive Crystal Yacht Cruises. The company plans to launch Crystal River Cruises in 2017. Three additional 1000-passenger all-suite luxury vessels will debut beginning in 2018 as Crystal Executive Class (and include residences for sale aboard each ship). Crystal will also launch Crystal Luxury Air in 2017, on a souped-up 787 Boeing Dreamliner which will accommodate 60 guests in business class seats on a series of 28-day itineraries visiting 10 to 12 exotic locations. While we're on the subject of cruise ships, a Chinese company is building a full size replica of the ill-fated Titanic, complete with a 'high-tech iceberg collision simulation,' set to become the centrepiece attraction at a theme park. The ambitious one billion yuan ($US 161.3 million) project is expected to open in 2017. While permanently docked on the Qijang River, it will replicate the original ship in every other detail, with opulent period interiors, from carpets to light fittings and luxury cabins. Guests will also get to sample the original menu served on the fateful voyage in 1912, along with ballroom dancing and entertainment of the era. An iceberg collision simulation with light and sound effects provide 'a dream-like experience,' the company said. An overnight stay starts at about $US 480. A percentage of revenue from the 1,500 visitors a day will go towards helping people affected by maritime disasters around the world. Following The Lanesborough's closure in December 2013, the hotel was taken back to its shell and meticulously transformed by Alberto Pinto, the world-renowned interior design studio. Now complete, the refurbishment extended to all areas of the hotel: the 93 guest rooms, including 43 suites, and all public areas. The renovation honors the building's architectural heritage as one of London's most revered Regency landmarks. It embodies the signature style that has become synonymous with The Lanesborough, while incorporating the latest in contemporary luxury and technological innovations. One of the world's most anticipated new resorts and Six Senses entr�e into China, Six Senses Qing Cheng Mountain has just opened in the picturesque gateway to the country's majestic Qing Cheng mountains, created to complement the UNESCO World Heritage & Natural Cultural site at nearby Dujiangyan. It was in this region known as the homeland of the Giant Pandas that the legendary Silk Road began. The 113 guest accommodations range from semi-detached suites in duplex villas with balconies and verandas, to courtyard suites, garden and pool villas. Two-and four-bedroom villas offer intimate seclusion, with indoor courtyard, whirlpool or pool, natural wood interiors, unrivalled amenities and exotic outdoor settings. ...changing the current 3-abreast seating in the class - in which the middle seat is blocked - to a 2-abreast to give travellers more personal space and legroom. WestJet does same in Plus. ...with Gatwick as the first transatlantic destination from Canada for its wide-body Boeing 767-300 aircraft. ...connecting downtown Toronto to Toronto Pearson (YYZ) airport with trains every 15 minutes, with a trip time of 17 minutes. ...new 853-ft, 6-minute transit time, pedestrian tunnel is the first land-link between Toronto's mainland and the island airport, Canada's 9th busiest. With three fascinating journeys, these luxury train trips from Dublin capture both the enchanting heritage and vibrant modernity of Ireland. For those seeking a unique way to experience Ireland, rail vacations aboard Belmond Grand Hibernian are sure to deliver. The train offers two-, four- and six-night journeys, all beginning and ending in Dublin. Each includes daily meals, drinks, excursions and guides. 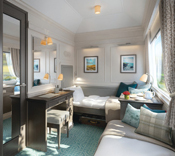 Rich with an authentic Irish atmosphere, the train's beautiful cabins mix modern luxury with traditional design to sumptuous effect, and connecting cabins are ideal for families. Journeys begin in Summer 2016. Whew! Confusion ended. On July 31, 2015, Four Seasons concluded its management of The Ritz-Carlton Chicago (A Four Seasons Hotel). Effective August 1, 2015, the Hotel became a full participant in the Ritz-Carlton system. This means that the Hotel will no longer be a Ritz-Carlton in name only, but it will be a part of the Ritz-Carlton family of hotels. 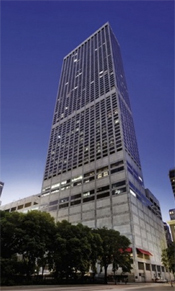 The Ritz-Carlton Chicago opened in 1975 in a tower atop Water Tower Place. It joined the Four Seasons Hotels & Resorts chain in 1977, as there was no Ritz-Carlton chain at the time. Confusingly, it remained part of Four Seasons for decades, marketed as The Ritz-Carlton Chicago (A Four Seasons Hotel). It had no association with the modern Ritz-Carlton chain, though it used the name and the iconic lion logo. Congratulations to all, and thanks for taking such great care of my clients! Air Canada customers eligible for TSA Pre Check who have completed web or mobile check-in no longer need to reprint their boarding pass at most US airports to participate in the program. Web and electronic boarding passes (including those on mobile devices and iOS Passbook) can now be scanned directly at most security check-points for those eligible for the program. Do you have a USD credit card? 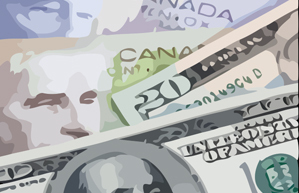 TI Canada has the facility to process charges in USD for clients with USD credit cards. This can mean that where there are USD deposits or payments made in advance of travel, I can have them applied directly to your USD credit card, thus saving you the foreign exchange transaction fees charged by credit cards, and at least one currency conversion fee. If you have a USD card, then that's probably why you got it - so let me know about it and I'll use it where we can. Most airfares and my service fee will continue to be charged in Canadian dollars. Canada has announced that starting March 15, 2016, certain nationalities who are visa exempt and will travel to Canada via air must obtain an Electronic Travel Authorization (ETA) prior entering the country. This initiative has been put into place to enhance the safety and security of Canada's border. US citizens are exempt from this requirement. 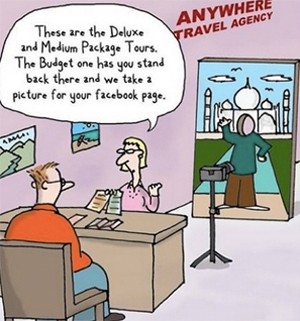 How To Travel Better Build a more fabulous trip with our annual roundup of travel intel. Amalfi 101 Everything you ever wanted to know about Italy's most celebrated coast. Mapping Miami How to navigate what's new in the city, district by district. How To Take Your Family Around The World After 13 months, a globetrotting clan returns to Austin, 34 countries the wiser. How To Travel At Every Age A road map to the world for every life phase. 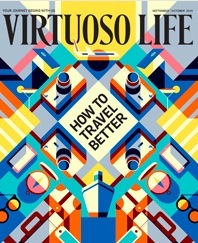 Read the complete current edition of VIRTUOSO LIFE now! In fact, check out the new Virtuoso Virtual Magazine Rack on my Website to browse all the great Virtuoso magazines! 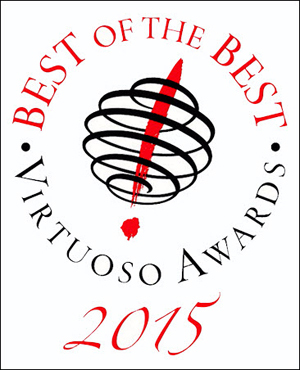 � 2015 Virtuoso, LTD.